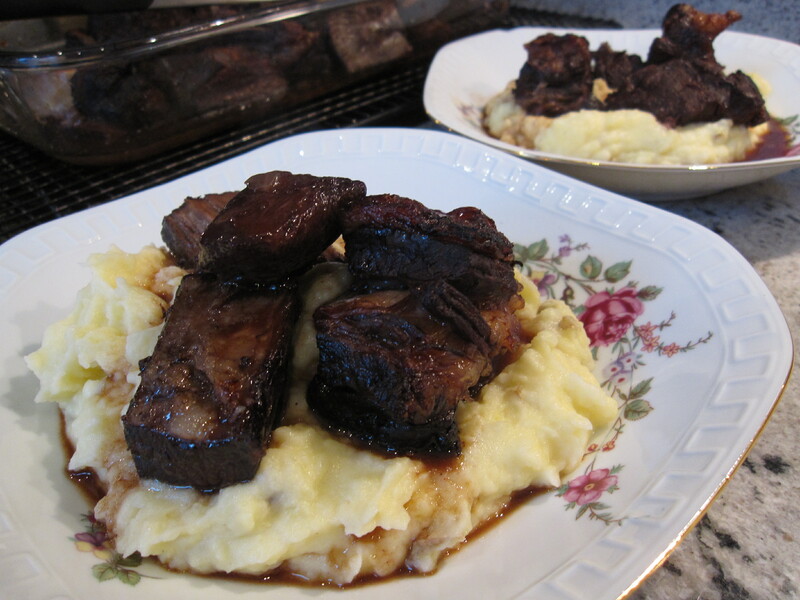 I am catching up with previously completed French Fridays with Dorie recipes and up this week is Short Ribs in Red Wine & Port. I’ll keep this short. I think that this was probably a very good recipe for short ribs, but short ribs in general are a bit rich for my tastes. I’m happy that I tried the recipe since I had never made them before, but it is unlikely that this one will be repeated in my house. This recipe did, however, prompt a discussion between my husband and I regarding mashed potatoes. Actually, about potatoes in general. Here in Germany I have noticed that potatoes are almost always peeled. Or if they are not, as with the very popular baked potatoes, the skins are pushed to the side and not eaten. Perhaps it is my rural upbringing, but in my family the only place one ever encountered peeled potatoes was in fancy restaurants. At home, all potatoes from mashed to boiled to baked, were prepared and eaten with the skins. I can still hear my mother’s mantra ringing in my ear, “all of the vitamins are in the skins”. Annoyingly it turns out that she was right and now I hear myself repeating this mantra to my husband every time he pushes his skins to the side of the plate. So how about you, do you peel your potatoes? This entry was posted in french fridays with dorie and tagged Around my French Table, german food, main course. Bookmark the permalink. Your short ribs look delicious! As for the potatoes, I leave the skins on because of the nutrients in the skin. Then I feel better about eating the potato flesh!